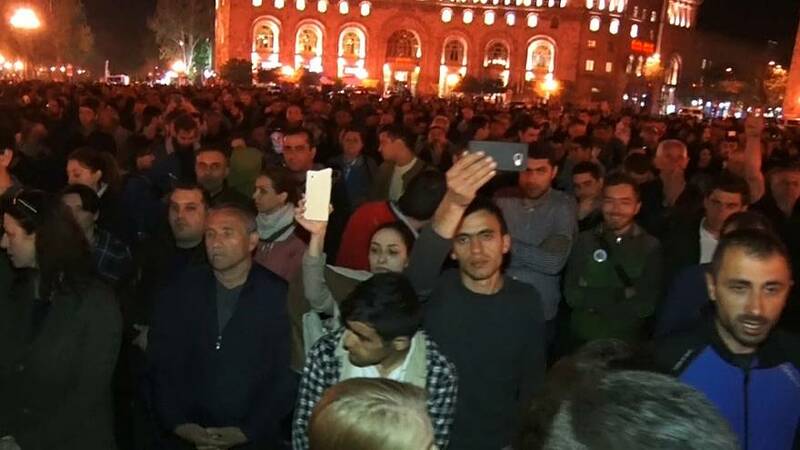 More than 16,000 people rallied in Armenia's capital on Wednesday night to protest against the election of former president Serzh Sarkisyan as prime minister. Critics say the leader's switch of jobs after a decade as president amounts to a power grab and undermines the county's democracy. "The students are willingly taking a stand as they realise the protests are important .... they represent a battle for their rights and freedoms," said one young man. "I believe the police have been using excessive force to try and control demonstrators. ...the use of a grenade which exploded right next to me injuring my leg was simply unacceptable. It once again shows they are capable of of killing people," said another. Although protest numbers were down on previous nights, organisers have vowed to mount a nationwide campaign of "civil disobedience". "Officials closed the entrances to the state buildings. Police officers regularly take into custody groups of demonstrators. The leader of the movement Nikol Pashinyan has announced a peaceful and velvet revolution," reports euronews' Ami Chichakyan.